This entry was posted on March 28, 2019 by Amberley Publishing. This book first appeared in September 2016 in a large format edition which enjoyed a brisk sale. It is now re-issued in a more compact size and enlarged by the inclusion of extra photographs, bringing the total to nearly 150. I have tried to supply chatty captions giving personal observations and recollections: accordingly there is quite a strong "authorial voice" which, I hope, provides a more entertaining read than a mere recital of facts. The photographs were taken between 1970 and 1982, when I was between the ages of twenty and thirty-two. Most of my contemporaries were either at the stage known as "sowing your wild oats", or had embarked upon its customary sequel, "settling down". The former mode of living struck me, even at that age, as a waste of one's precious time on Earth, whereas marriage, child-raising and mortgage-repaying were, in my case, to be deferred for some years. Taking photographs was one of my favourite pastimes, at first using a primitive pre-war camera my father had passed on to me when I was about twelve. Once I'd left school and could afford film and processing I began to travel around taking photos of the rapidly disappearing industrial townscapes of the Midlands and Lancashire. Those few who knew of it clearly regarded this as an eccentric occupation and I learned to be evasive about it. The photographs, in the form of 5X3½-inch "enprints" processed through my local branch of Hodders, the chemists, were mostly pretty dreadful. Nevertheless some of my favourite shots were taken in those early days with that first camera, and in recent times, with the aid of a flatbed negative scanner, it has been possible to improve greatly on the originals. In the book's Introduction I relate how, in April 1970, I became a bus conductor and saw the newly flattened ruins of Bristol's Newtown district from the top deck of my bus. To me, still at an age when experience has a hormonally-fuelled intensity and over-heatedness, there was an uncanny beauty in the scene. I had been powerfully subject to nostalgia from an age when, logically speaking, I had not yet anything to be nostalgic about. I can only state that this was so: my surroundings were dear to me and any changes in them, even something as trivial as the felling of a tree or the realignment of a kerb, had the power to distress me. Within days of first seeing Newtown I went back with my camera to roam wretchedly among the weed-choked foundations and shattered pavements, filled with hopeless longing for what had gone and could never again be seen. I had sufficient self-awareness, however, to realise that in this experience pain was intermingled, more or less equally, with a morbid pleasure. Although I must have passed by often without taking any notice, I could not remember Newtown when it had been standing. I reached back into my memory but could never quite grasp hold. The most fascinating historical period is always that just beyond the reach of one's own recollections. By this time we, of the post-war baby-boom generation, had become accustomed to the process called "redevelopment". Having limbered up with the rebuilding of areas devastated by wartime bombing, the local authority planning departments – whose principle motive, as with any bureaucracy, is self-perpetuation – turned their attention upon other areas that could be regarded as in need of renewal. All this coincided with a boom in the value of property, a growth in demand for office space and, of course, a great increase in road traffic. 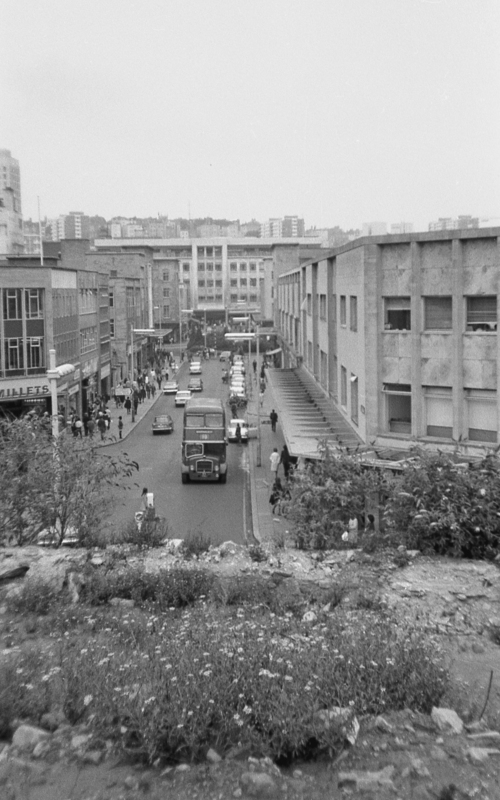 Georgian squares and Regency terraces disappeared to make way for roundabouts and dual-carriageways, as working class "inner city" areas were flattened wholesale and their residents rehoused in tower blocks or grim estates at the city's edge. Not only Newtown, but also neighbouring Easton had been razed in the late sixties, and now as the seventies opened the Council flattened all the lower part of Totterdown for a road scheme that was abandoned even as the final demolitions were taking place. There were a number of specific outrages: the University and Royal Infirmary, between them, were allowed to violate the picturesque slopes of Kingsdown; the bombed Castle Street shopping centre was rebuilt, not on the same site, but a few hundred yards to the north in the old streets around Broadmead, which had been largely untouched by the air raids; St James's Square was destroyed for the enlargement of a roundabout. 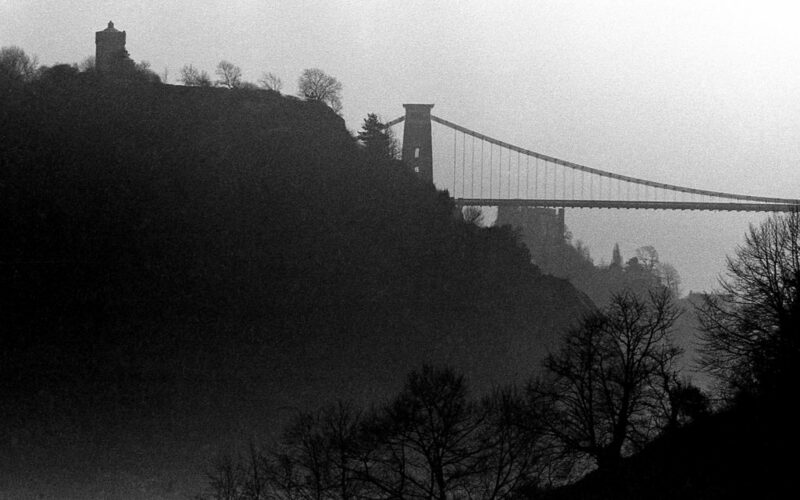 A scheme to construct a shoebox-shaped hotel on the slope of the Avon Gorge just below the Clifton Suspension Bridge, was only narrowly averted. By the time I'd started taking photographs around Bristol, the early redevelopment frenzy had begun to run out of steam and attract public disfavour. It finally ground to a halt quite abruptly around 1975. This left many parts of Bristol in a kind of limbo: large areas had been cleared but not rebuilt; condemned buildings were reprieved and left empty awaiting a decision on their future; whole districts, such as the older, architecturally distinguished part of St Paul's around Brunswick Square, were left to rot – one suspected until such time as further deterioration would leave them beyond saving. Much though I deplored these things I would concede that they were interesting from a photographic point-of-view; there was no shortage of scenes for my camera to record. 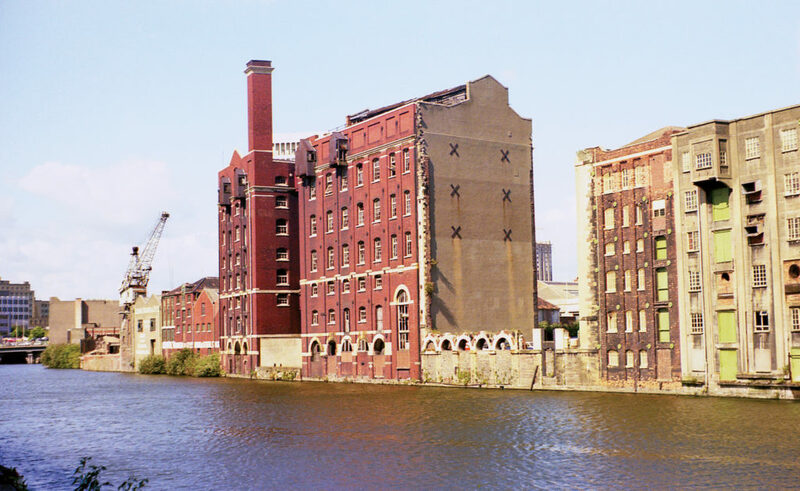 Many who read the original edition of the book remarked how shabby Bristol looked at the time. It was not my intention to emphasise this squalid aspect of the city: like most people I have a great affection for my native place and would not wish to do it a disservice. It was in the nature of the times and subject-matter that the book should paint a rather unflattering portrait. The preparation of the original book fell during an eleven-year exile in East Anglia, when it was difficult for me to keep abreast of developments in Bristol. I have since moved to South Wales and it has become easier to revisit my old haunts, which I now see as if with fresh eyes. My main impression is of a kind of visual sterility. Much that was distinctive about the city has given way to an even spread of ICLEI-sponsored sustainable development, dockside micro-apartments, low-rise Lego-brick offices, fake street furniture, sanitised “heritage” showpieces, pedestrianised shopping centres, bus lanes, wheelchair ramps, fraudulent retro paving, Veolia wheelie-bins, Caffè Nero outlets that were once post offices or police stations, nonsensical "installations" and rubbish sculpture and, everywhere, surveillance cameras. A worrying point is that every British city looks like this now. Everywhere looks like everywhere else. Local, and even national distinctions, become fewer and fewer. The whole world is becoming as bland and homogeneous as a blancmange, one place fairly indistinguishable from any other unless, here and there, by climate or terrain. Eventually there will be nothing to which anyone will feel any particular connection or allegiance. This, I suspect, is the intention. 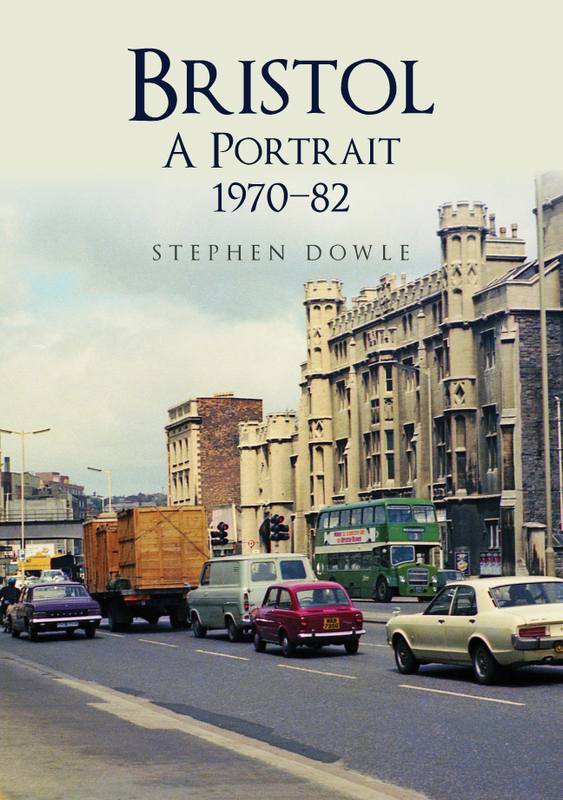 Stephen Dowle's new format paperback of Bristol A Portrait 1970-82 is available for purchase now.